Once a nautical town and now transformed into one of the major resorts of the Mediterranean coast. Situated right at the heart of the Costa Dorada, it boasts 10km of beaches with smooth, golden sand. Salou: 'the beach of Europe', a tourist resort with a young, lively atmosphere. 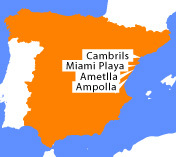 A tourist site situated to the south of Cambril, with the splendid Pino Alto beach, and the small smooth-sanded coves in the north. The 'BONMONT' Golf Course designed by Trent Jones, one of the most picturesque in Europe. A small fishing village that has held on to the traditions of its long history. Here you will be welcomed by alluring bays and stunning coves with clean sand and clear water. Enthusiasts of water sports and all kinds of fishing will find everything they need for unadulterated enjoyment (blue sea with the mountain close by) - complete relaxation awaits you. A picturesque village with typically nautical charms, combining the features of a boating resort and a fishing port. The coastline here has a great variety to offer: small coves and smooth, sandy beaches. Nearby is the Ebre Delta, a vast plain fanning out into the sea.